After three days and nine competitions, the House of Susan B. Anthony made history Thursday night as the first female House to ever win Interregnum - a school wide series of artistic and academic competitions at The King's College. The House of Sojourner Truth took second and the House of Winston Churchill placed third. "I felt it was very historically appropriate seeing as how Susan B. Anthony was [so revolutionary] when it came to women," sophomore Hannah Rawlf said. "SBA winning was kind of like we revolutionized Interregnum." Truth won first in the Great Speech, Long-term art, and the Reading Test and third in the Creative Writing competition. Churchill won first in the Prepared Lecture and second in Creative Writing. SBA swept Interregnum VII with first place in Academic Writing, first in Creative Writing, second in Parliamentary Debate, second in Random Theme Debate and third in the Reading Test. Lauren Hall wrote the Creative writing piece, a rendition on Peter Pan's villain Captain Hook, and Annie Clark and Kelsey Kosin wrote the academic paper. Alexandra Harrison, a member of the Interregnum VII Committee knew early Thursday afternoon that SBA won, but had to contain her excitement. "When we announced it, it was the best feeling ever," Harrison said. "SBA is fantastic and I think that came through." But Interregnum points were not enough to pull SBA to the top of the year's final House ranking. 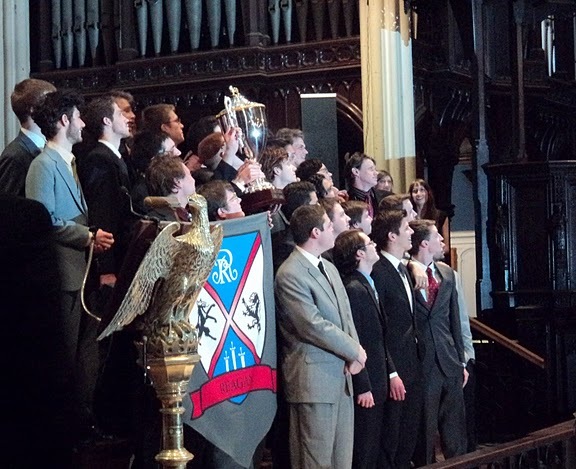 The House of Ronald Reagan, though they placed seventh in Interregnum VII, took home the House Cup. Only fifteen points separated first and third place. Reagan totaled 495 points, the House of Margaret Thatcher took second with 485 points, and the House of Queen Elizabeth I took third with 480. Reagan has won Interregnum twice in the past. This is their second time to win the House Cup. "We had higher hopes than winning," Reagan Chamberlain Jonathon Clark said. "We didn't care about winning competitions." Instead, he says the house focused on attaining their House values of loyalty, fraternity and honor, Clark said. He also attributes their success to "a great group of freshmen" and the leadership of the executive team. "We wanted our guys to come out of [the House experience] with the House values," Clark said. "If we win, so be it. Ultimately, to [God] be the glory."